Indian 2 Wheeler maker, Royal Enfield which is a subsidiary company of Eicher Motors has sold 200 units of special limited edition Royal Enfield Despatch today with a time frame of just 30 minutes. The sale began online at exactly 10:00 am today ( 15-July-2015). Within 30 minutes after the sale began all the available stock of special limited edition Royal Enfield were sold as the Royal Enfield enthusiasts didn’t make any mistake in placing their order first. 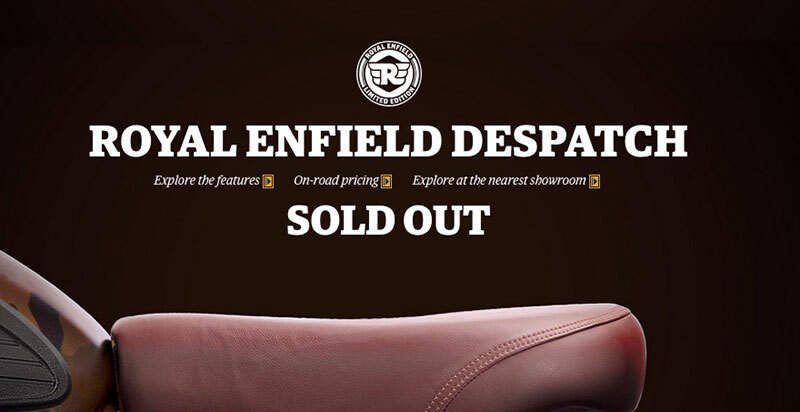 The Royal Enfield Despatch Page now prominently displays the message that the motorcycles are sold out. Royal Enfield Twitter handle announced the same too.